With his profits [from his Alta Loma investments], Billy Skirvin bought an acre in the new Spindletop field near Beaumont, and hit oil. The Skirvins struck it rich. In 1906 Billy moved his family to Oklahoma City, set up the American Oil & Refining Co. and sold shares in its holdings. With the money, he built the 14-story Skirvin Hotel, still one of Oklahoma City's best. So, when Perle arrived in Oklahoma City in 1906, she would have been about 17 years old. According to an Oklahoman article, she attended "music school in the east" after which she married in 1917. After that, she apparently only returned to Oklahoma City to visit, except for a brief residence after her husband died in 1929 and except that, due to her broken hip, she returned to Oklahoma City in 1973 to be near her brother, O.W. Skirvin. She died in Oklahoma City on March 16, 1975. Bill Skirvin built a house at 700 NW 16th in 1909 or 1910 (reports vary on the construction date). He took title to the lot on which the home was built from Anton Classen's company (The Classen Company) on January 9, 1909, and Skirvin's company sold the property to another on August 11, 1911, according to official deed records. So, it's kind of hard to say that the house at which the family lived for only two or so years could be considered Perle Mesta's "childhood home", even though it is widely regarded as such. An August 19, 1989, Oklahoman article's headline reads, "Perle Mesta's Childhood Home Purchased." It remains known as that until this day. Here's what it looks like today. Click the pic for a larger image. Much of the neighborhood west of Walker to Classen, south of NW 23rd to around NW 16th, bears her name today and is the Mesta Park Historic Preservation District. I live in this neighborhood and her former home is about 4 blocks from my house. 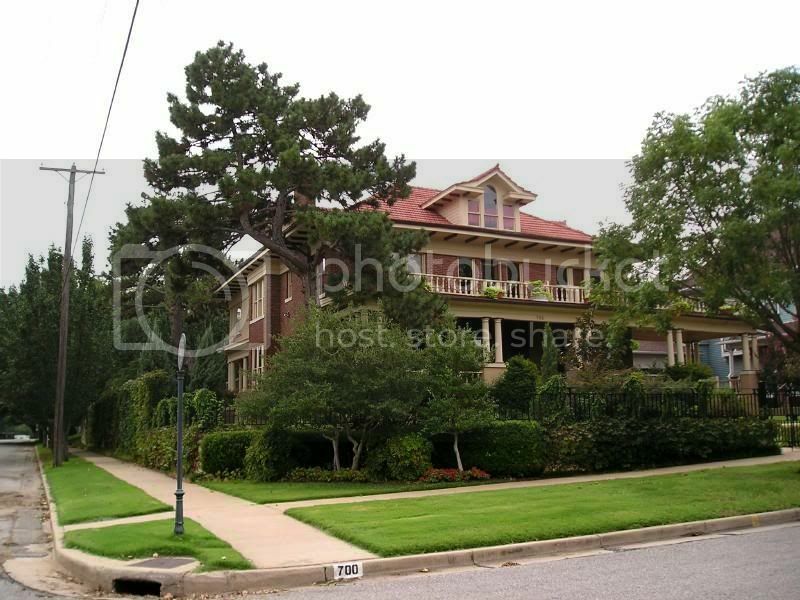 My home, also built in 1910, is not nearly so grand as the Skirvin/Mesta home, though! Here's the neighborhood association website: http://www.mestaparkna.com/. Hostess with mostes' left mark on state, D.C. Leading up to Oklahoma's Centennial, The Oklahoman will profile Oklahomans who significantly contributed to the state's success. The Mesta Park Neighborhood Association will sponsor a screening of the film "Call Me Madam" at 6 p.m. July 29 in Kerr-McGee Auditorium at the Meinders School of Business at Oklahoma City University, 2501 N Blackwelder. The film, a 1954 Oscar winner, is the screen adaptation of Irving Berlin's hit musical of the same name. Berlin based the musical on the life of Oklahoma resident Perle Mesta, for whom the Mesta Park neighborhood is named. Famed for her lavish Washington, D.C., parties, Oklahoman Perle Mesta became the original "hostess with the mostes'" and earned a place in Broadway and film history. 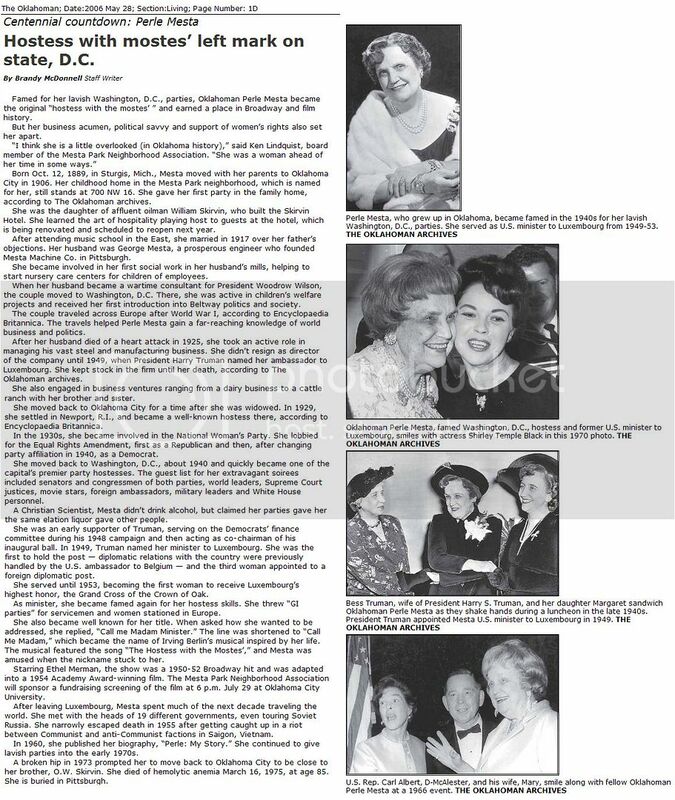 But her business acumen, political savvy and support of women's rights also set her apart. "I think she is a little overlooked (in Oklahoma history)," said Ken Lindquist, board member of the Mesta Park Neighborhood Association. "She was a woman ahead of her time in some ways." Born Oct. 12, 1889, in Sturgis, Mich., Mesta moved with her parents to Oklahoma City in 1906. Her childhood home in the Mesta Park neighborhood, which is named for her, still stands at 700 NW 16. She gave her first party in the family home, according to The Oklahoman archives. She was the daughter of affluent oilman William Skirvin, who built the Skirvin Hotel. She learned the art of hospitality playing host to guests at the hotel, which is being renovated and scheduled to reopen next year. After attending music school in the East, she married in 1917 over her father's objections. Her husband was George Mesta, a prosperous engineer who founded Mesta Machine Co. in Pittsburgh. She became involved in her first social work in her husband's mills, helping to start nursery care centers for children of employees. When her husband became a wartime consultant for President Woodrow Wilson, the couple moved to Washington, D.C. There, she was active in children's welfare projects and received her first introduction into Beltway politics and society. The couple traveled across Europe after World War I, according to Encyclopaedia Britannica. The travels helped Perle Mesta gain a far-reaching knowledge of world business and politics. After her husband died of a heart attack in 1925, she took an active role in managing his vast steel and manufacturing business. 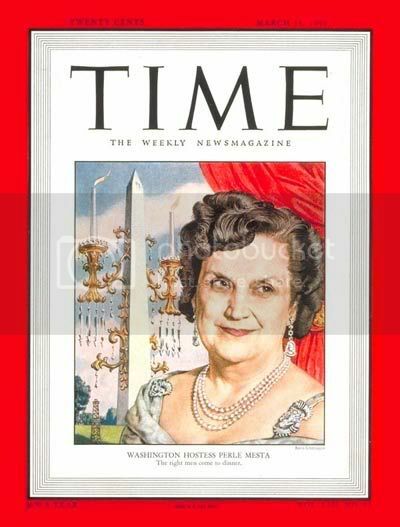 She didn't resign as director of the company until 1949, when President Harry Truman named her ambassador to Luxembourg. She kept stock in the firm until her death, according to The Oklahoman archives. She also engaged in business ventures ranging from a dairy business to a cattle ranch with her brother and sister. She moved back to Oklahoma City for a time after she was widowed. In 1929, she settled in Newport, R.I., and became a well-known hostess there, according to Encyclopaedia Britannica. In the 1930s, she became involved in the National Woman's Party. She lobbied for the Equal Rights Amendment, first as a Republican and then, after changing party affiliation in 1940, as a Democrat. She moved back to Washington, D.C., about 1940 and quickly became one of the capital's premier party hostesses. The guest list for her extravagant soirees included senators and congressmen of both parties, world leaders, Supreme Court justices, movie stars, foreign ambassadors, military leaders and White House personnel. A Christian Scientist, Mesta didn't drink alcohol, but claimed her parties gave her the same elation liquor gave other people. She was an early supporter of Truman, serving on the Democrats' finance committee during his 1948 campaign and then acting as co-chairman of his inaugural ball. 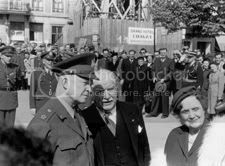 In 1949, Truman named her minister to Luxembourg. She was the first to hold the post -- diplomatic relations with the country were previously handled by the U.S. ambassador to Belgium -- and the third woman appointed to a foreign diplomatic post. She served until 1953, becoming the first woman to receive Luxembourg's highest honor, the Grand Cross of the Crown of Oak. As minister, she became famed again for her hostess skills. She threw "GI parties" for servicemen and women stationed in Europe. She also became well known for her title. When asked how she wanted to be addressed, she replied, "Call me Madam Minister." The line was shortened to "Call Me Madam," which became the name of Irving Berlin's musical inspired by her life. The musical featured the song "The Hostess with the Mostes'," and Mesta was amused when the nickname stuck to her. Starring Ethel Merman, the show was a 1950-52 Broadway hit and was adapted into a 1954 Academy Award-winning film. The Mesta Park Neighborhood Association will sponsor a fund-raising screening of the film at 6 p.m. July 29 at Oklahoma City University. After leaving Luxembourg, Mesta spent much of the next decade traveling the world. She met with the heads of 19 different governments, even touring Soviet Russia. She narrowly escaped death in 1955 after getting caught up in a riot between Communist and anti-Communist factions in Saigon, Vietnam. In 1960, she published her biography, "Perle: My Story." She continued to give lavish parties into the early 1970s. A broken hip in 1973 prompted her to move back to Oklahoma City to be close to her brother, O.W. Skirvin. She died of hemolytic anemia March 16, 1975, at age 85. She is buried in Pittsburgh. Contributing: News researcher Mary Phillips. Last week, in a richly furnished room overlooking the lights of Washington, the Vice President of the United States danced a little solo to the strains of an accordion and a guitar. Secretary of the Treasury John Snyder and Postmaster General Jesse Donaldson beat time, grinning appreciatively. With the Italian ambassador and the others, Senator Tom Connally and Colonel Louis Johnson, the new Defense Secretary-to-be, caroled My Old Kentucky Home and The Eyes of Texas Are Upon You. Mrs. Perle Mesta, all gotten up in a brown net Dior dress, was entertaining at "Uplands." Perle Mesta is the capital's No. 1 hostess, a position she had inherited, almost by default, from a long line of free-spending, haughty, and sometimes charming dowagers. Hostess Mesta had discovered a useful and economical secret: her kind of guests like to entertain each other. At Perle Mesta's parties, Harry Truman has played the piano, General Ike Eisenhower has sung Drink to Me Only with Thine Eyes (in a shaky baritone), Pat Hurley, without too much encouragement, has given his Comanche war whoop, and Mrs. Cornelius Vanderbilt has whistled in a duet. On such jolly occasions, the food is always bountiful, the liquor excellent and plentiful. A teetotaler herself, Mrs. Mesta sips Coca-Cola and warily watches the spirits rise around her. She likes everybody to be gay, but not to get out of hand. It is a kind of entertaining peculiarly suited to the plain Government of plain Harry S. Truman. So is Hostess Perle Skirvin Mesta. The Cribbage Board. A hearty, goodfellow type of woman, Perle Mesta is an Oklahoma widow, whose wealth came from a marriage of Oklahoma oil and Pittsburgh machine tools. Not even her warmest admirers, who liked her liveliness, would credit her with overwhelming charm or notable wit. But ambassadors, Senators and Cabinet officers come at her beck. In a city where a hostess' success can be scored like points in a cribbage game by counting up the rank of her guests, Perle Mesta outscores them all. Unlike her predecessors, Perle Mesta won her position not by prestige and not alone by wealth. She won by 303 electoral votes —those that elected Harry Truman. Professional society is based on entertaining people who are not necessarily your friends. Washington visitors are astonished at the ferocity with which it is practiced in the capital. Years of rigorous competition have produced a prototype of the hardy, or winter-blooming Washington hostess. She is a widow, past 60, of ample means and ample bosom. She must have enough forwardness to fight for her prey, enough toughness to withstand the fangs of her rivals. Center Ring. The main ring in Washington's three-ring circus is the official circle. Here are the big governmental names which the successful hostess, of whatever circle, must catch. Most of them are ready to be caught: they hold offices of high prestige and medium salaries, which limit their own powers of entertaining. In, this ring, Perle Mesta is supreme. Perle Mesta's parties are neither so fancy nor so noisy as Mrs. Evalyn McLean's, so exclusive as Mrs. Truxtun Beale's, so smart as Mme. Bonnet's at the French embassy. Her menus are adequate but not sumptuous. At the Alben Barkley dinner last week, the 24 guests had turtle soup, filet of beef, peas, browned potatoes, aspic salad, and a rum-and-ice-cream dessert. No Senator need worry at a Mesta party if he cannot quote Oscar Wilde, if he thinks Picasso is a ham & eggs painter, or is unable to pronounce the name of French Premier Queuille. In the new, hearty Mesta milieu, the lorgnette has abdicated to the guitar. Said a friend: "You go to a great many beautiful formal houses here where people barely speak above a whisper. You go to Perle's, and you know it's going to be fun." Little Girl. When she is asked about her past, Perle conjures up a picture of an Oklahoma childhood liberally sprinkled with scenes of little Perle in colored hair ribbons matching the sash around her waist. The little girl lived in a big, red brick mansion with stables out back, where each child had its own Shetland pony. Perle likes to say that she organized her first party on her twelfth birthday. No Shoes. Billy Skirvin did not go in for society stuff. He loved to sit in the lobby of his hotel in his stocking feet, talking. In later years, he drank, and about 9 o'clock every evening, a thin, wiry little woman would come down to the lobby, pick up his shoes and lead him off upstairs. 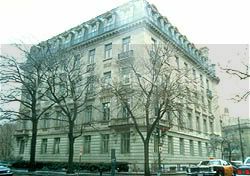 She was Mabel Luty, and she was his confidential secretary for 31 years. But Billy did his best to make Pearl (he never could remember to spell it Perle) happy. He put $36,000 into sending her East, gave her a fancy car, and kept her there in good husband-catching style. In 1916, Perle met George Mesta. A year later she married him. George Mesta was 54, a tall, blond man of Italian descent who was president of the Mesta Tool Co. in Pittsburgh, and a World War I $1-a-year man in Washington. For Perle, he was the first big step. After the war, he took her abroad 22 times, started building her a $600,000 limestone house in Pittsburgh where she could entertain. He contributed $100,000 to Coolidge's campaign, and Perle was rewarded with three overnight visits to the White House. Then in 1925, Mesta, to whom his wife referred affectionately as "the wop," died. Perle got $845,000. Getting Ahead. Perle never lived in the $600,000 house, which was finished just before Mesta's death. She found Pittsburgh society "too stuffy." She bought a place in Boston, and sold it after two weeks, bought a cattle ranch in Arizona, and resold it because it was "too lonely out there." She also took a place in Newport, began entertaining cautiously and discreetly, got inside the door at aloof Bailey's Beach, eventually established herself firmly among the matriarchs of Millionaire's Row. She struck up a friendship with Hoover's courtly Vice President Charles Curtis, who spent a week at her Newport mansion. He got her presented at the Court of St. James's in 1931. Once Perle Mesta had to drop her social campaigning and hurry back to Oklahoma City. There brother O. W. Skirvin was keeping an eye on old father Billy. He peeked into his father's safe, found the old man had made out stock transfers of his American Oil shares to his three children. Billy learned of his son's doings, in a fury tore up the certificates. Perle sued her father for misappropriation of the hotel's and oil company's assets. Some suspected that Perle was afraid faithful Secretary Mabel Luty would get her inheritance. Receivers were appointed and the case was bitterly argued for six years. In court, old Billy wept. The judge bellowed at them: "You Skirvins ought to be ashamed of yourselves." On appeal, the court turned the properties back to Billy. That same day, he was injured in an automobile accident, died two weeks later. Perle got about $400,000. Factoids: She was a mystery guest on CBS's What's My Line on August 12, 1956, and a CBS's Playouse 90 did a play about her on March 21, 1957, Shirley Booth playing her adult character and Evelyn Rudie playing her when younger. Paul Lesch, a Luxembourg resident, recently wrote a book, Playing her Part: Perle Mesta in Luxembourg. See http://www.amcham.lu/publications/perlemesta.php. McCormick Apartments, where she lived and partied-down in Washington (some of the time). It now houses the National Trust For Historic Preservation. The description there is impressive! 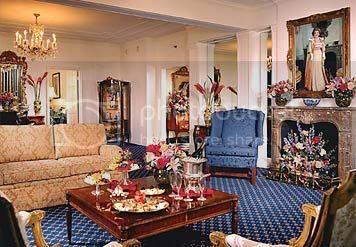 Perle Mesta Suite at D.C.'s Wardman Park Marriott near Dupont Circle. She has a restaurant there, too! Click the pic ... it's cool! 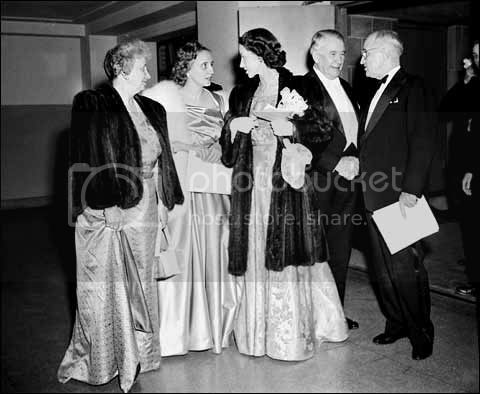 A 1949 Party With The President: Left to right: Truman's wife Bess, daughter Margaret, Perle, Vice President Barkley, and President Truman. See this link. Click the pic for a larger image. From a film, Call Her Madam, at a Luxemborg website. 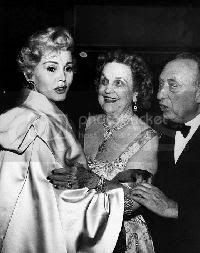 This 1952 pic is from Scott Foster's Aloha Oklahoma!, showing Zsa Zsa Gabor, Perle, and some guy with hands. Click the pic for a larger image. Is Perle an Oklahoma City "Hero"? No, probably not. She really didn't contribute to this city in any way that I know of, unlike her father, and she hardly lived here. Still, she's certainly a fascinating part of our history in which we can participate, vicariously! Does anyone know if there was a Sally Skirvin born about 1932? Any site with the family tree? Sorry, anon, I don't know. Annon, As one of Perle Mesta's grandnieces, I have never heard of a Sally Skirvin. But if she is from our family tree, I would greatly appreciate learning about her. Mesta Mansion is West Homestead is one of my favorite all time homes. It is located on 540 Doyle Street. The home fell into horrible disrepair, but looks as if someone has taken an interest and is being repaired. The picture does not do this justice. Actually yes. I had taken an interest in purchasing the Doyle Avenue property myself when it was listed as a foreclosure. It was listed by Priority Realty for I BELIEVE $67,000. The gentleman who outbid me has apparently done quite a bit of improving, as per his website at www.mestamansion.com. Anyone who's been inside would tell you it defies description. The mahogany staircase by the kitchen, the ball room, and the huge original kitchen complete with whatever the hell one would call that little room in the back where the ice was kept. lol. It really is quite an amazing place. I wish I could see it now that it's fixed up. I have a signed photo that Perle gave my father in the late 60's or early 70's that I remember my dad showing me as a child. Recently there was a death in my family and I found the photo. It will be again proudly displayed. Very neat, anon! You've got a really fine piece of history. Unfortunately, that amazing interior mentioned in a previous post no longer exists now. We toured the house today. The owner who was doing the "renovations," has given up on the project after gutting it, and the place is for sale for $199,000. There are architectural drawings available in the house, if the new buyer is interested. It was very uninteresting to see...it's a hull. The only thing awesome about the place now is it's size. Very sad. My mother bought a piano at an estate auction that claims that it was in the Skirvin Hotel and played by her and Harry Truman / Irving Berlin. I'm told there are pic of that party but I can't find any. If Anyone has information, I'd love to hear from you. Coming to this blog very late in the game, but my family had an elderly neighbor & friend who was born in 1894. In the 1920s, Miss Ed Louise Ballman & her friend Miss Helen McLean 1891-1979, who visited Fort Smith often, would drive from here to OKC to visit with Pearl Mesta at the Skirvin Hotel. I'm not sure who knew who first but Helen was Bess Truman's childhood friend, neighbor & classmate since she grew up next door in Independence, MO. It was very adventurous for 2 rich single ladies to drive themselves to & from back in those days.